There are times when being a school librarian is not good for my emotional well being. I am one of those librarians, for example, who, after helping students research diseases in health classes, goes home and thinks that I have symptoms of every disease that we researched. Admittedly, going home from school and worrying that I might have 12 different diseases probably has less to do with my chosen line of work than my personal emotional tendencies, but the point I’m getting to here is that I tend to see a lot of myself in whatever it is that I read. I have been trying, for years, to find ways to build “healthy news consumption” into our information curriculum. I don’t know why, but for a very long time I assumed that although they gamed a lot and spent time on different platforms than I, that students’ digital lives were at their core ultimately similar to my digital life. In retrospect, that was not one of my all time best professional judgements. Upon returning to school from winter break a few weeks into the partial U.S. Federal Government shutdown, an informal survey of some of our classes indicated that our students were woefully uniformed on the news of the day. While I (and many of the other adults on campus) were living large, gorging to excess, and seeing many of the unhealthy symptoms of information obesity, a significant proportion of the students we teach were suffering from information starvation! In thinking about how to bring news and current events into our students consciousness without making them information obese I just do not believe it realistic to expect that my students would all seek out print newspapers as suggested by the New York Times article. In thinking about how we might help students develop healthy news diets, I have largely given up on news aggregating apps like Apple News or Flipboard. The algorithms that underpin them seem to have (IMHO) become so good at giving me what I want that I gorge myself with little awareness of how effectively I am protecting my ego and my worldview by confirming my existing biases. 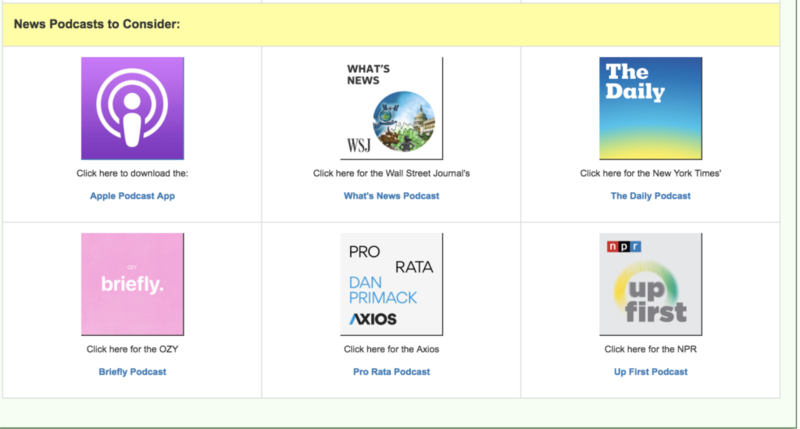 Newsletters as the New Front Page? 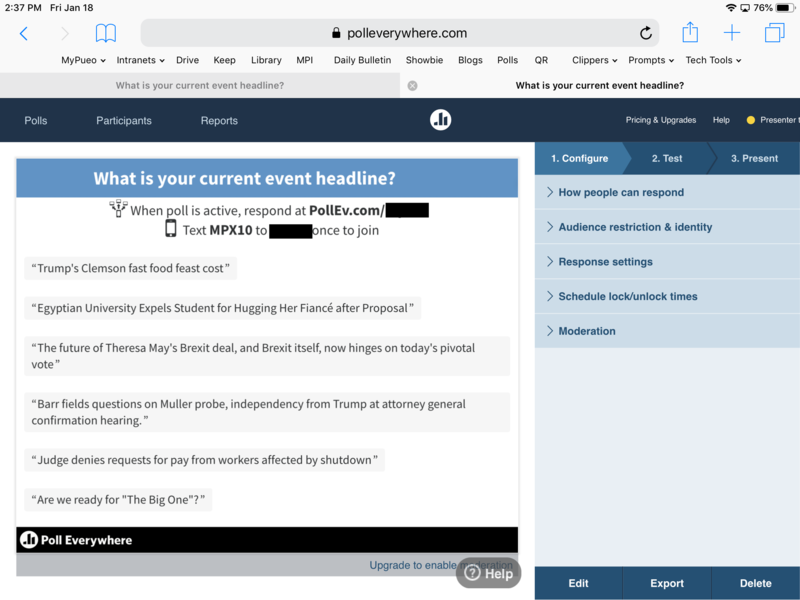 In looking for ways to help my students find a curated and limited set of stories that might strike the balance between being comprehensive yet not overwhelming, we’re giving the email newsletter subscription a try. Click here to view the full Libguides page. Note: The sampling of sources listed were chosen because they provided content without a paywall and reports in Media Bias Fact Check and Allsides that indicated that the sources largely fell into the center, center-left, or center-right range for bias and/or factual reporting. 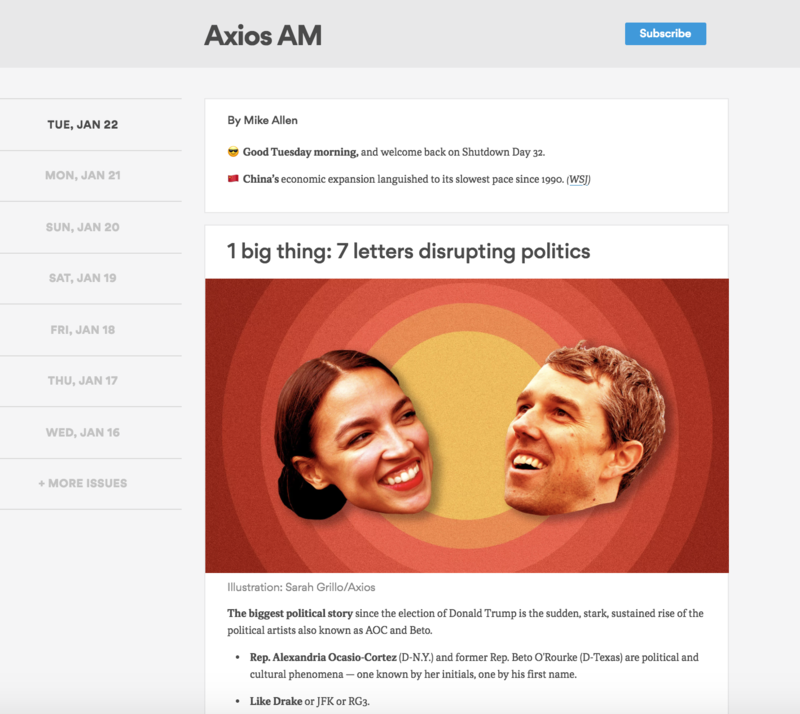 Click here to go to a sample of the Axios AM newsletter. Bullet pointed news first struck me as rather peculiar, but the longer I have subscribed the more I like the concept. It’s a format that is especially well suited to reading on a phone screen. Something that we had to keep in mind is that learning to read and consume news thoughtfully is a deceptively hard task. Think about it, reading news is like watching a daily soap opera. After a number of weeks, months, or years watching a soap opera if you tune in to an episode of a soap opera on Tuesday you will likely know which characters are telling the truth about the death of the evil banker and which characters are lying to cover their involvement in his murder, but a first time viewer would likely find the storyline rather disjointed and challenging. Introducing students to news takes time and there will be lots of questions that might make you want to sigh and roll your eyes, but which, if you are 14 years old are perfectly legitimate questions. Who is Nancy Pelosi and what does she do? Why are some parts of the government shut down and not others? How is trade supposed to work when there isn’t a [trade] war? Why are the workers in France so angry? Getting students to continue to read the news over a sustained period of time is completely dependent on having classroom teachers, like Billie who is piloting this effort with me, who are committed to investing the time it take to help her students get to the point where they can make enough contextualized meaning from the news they are reading so that it will sustain their interest and drive their news reading habits to continue whether they are an assigned task or not. Billie has been having her students read their email newsletters, then has them share a story that they are following via Poll Everywhere. After the initial listing of articles, students sit in small groups and chat about the stories they’re reading and following, and they’ve been trying to group the stories by relevance or themes as a class. The articles on the board move around based on new information or as they come to new understandings or contexts. This a pilot effort that we’re just trying to get off the ground. 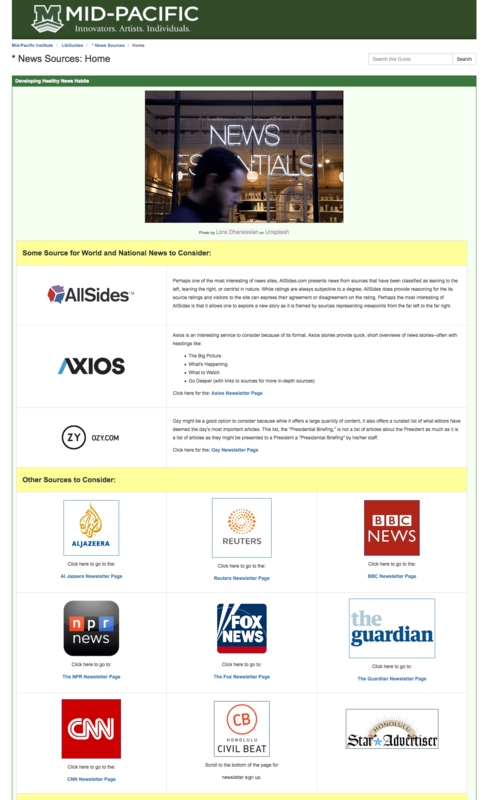 We’ve started with just email newsletters, but our students are also very drawn to non-written forms of media so in the coming weeks we will likely try having them try daily curated news podcasts to see if getting news that way works well for students. As students get their news reading feet under them, I would love to introduce common logical fallacies and have students begin to see they can find any of them in the articles they’re reading. Can your group find an example of an ad hominem fallacy in your articles? Can your group find an example of a correlation causation fallacy in your articles? Can you find an example of an excluded middle fallacy in the articles you’ve read? It’s all a bit daunting and much of this effort’s success lays with the level of buy-in and follow-through of the classroom teachers that partner with us in this endeavor. I love that you are taking such a proactive approach to news literacy/having a steady diet of current news. 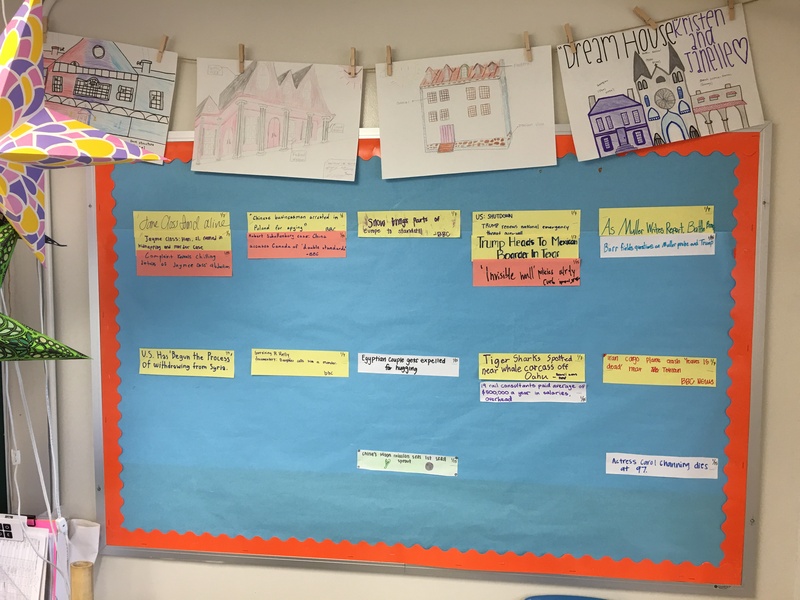 We’ve been thinking about ways to post current news stories on our digital display every day or switch out topics monthly for printed information on bulletin boards. All of it seems like a moot point if students are doing the work on their own though. Hmm. We’re just starting and piloting. Hoping to get into more classes shortly. Realistically, we won’t be able to scale to 100% of our HS students so perhaps this is “do both if we can” situation! Thank you for thoughtful post! I read articles in our local printed paper at breakfast (20 min) and spend longer on weekends (present to myself: the Sunday New York Times). I prefer print because I do not want to be on my device early in the AM. I hadn’t thought about the satisfaction of the final page-turn. I bring my print paper to school most days, and put it out for others. Surprisingly many glance at headlines or give a quick flip through sports or comics. When I’m in NY, I LOVE reading the Sunday NYT! I buy it on Sunday and read it all week (I’m a s-l-o-w reader). We have our local paper on the counter every morning, but typically we only have one English teacher who will flip through it a few times a week, and kids will seek out the sports section when there is coverage about them or about their friends. I wish it were different, but that’s just what we see. Dave, I really admire your commitment to ensuring your institution creates students who are prepared for what they’re really going to confront. Sure, they need bibliography skills, but in their day-to-day what they really need is to navigate a landscape that lately seems designed to confuse, alarm and misinform. You’re helping them launch as adults who will be able to peer into the mist and see the facts for themselves. It’s not just this assignment – it’s a lot of what you post about regularly, and I am very glad to see it and be inspired by it.